TV My Wife Watches: The Morning Scone: Clint Dempsey is a P.I.M.P. Turn up the lights in here baby. Extra bright I want ya'll to see my tattoo! 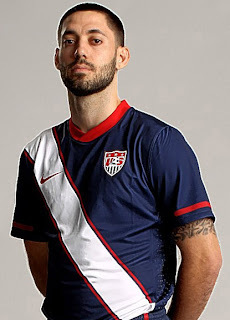 For those of you who may not follow soccer football, and have not created yourself on Playstation's FIFA as an attacking midfielder for AC Milan (my name is Monnini), Clint Dempsey is arguably the best American footballer ever. Now clearly, I just lost half my female audience with that last sentence, so let me add a few sentences to bring the ladies back: Real Housewives of New Jersey is crazy! So You Think You Can Be America's Next Top Sister Wife is insane! My wife yells at me for using too much fabric softener! Back to Clint Demps, who last night scored another key goal for the US National Team vs. Panama, further cementing his undeniable pimp status. This past weekend, after scoring versus Jamaica, Clint celebrated by doing the old "You can't see me," hand-wave move in front of his face while screaming, "You can't see me motherf*ckers! You can't see me!" Deuce (oh, that's what he calls himself by the way, "Deuce") also recorded a rap song a few years ago with some grimy Texas rap group for a Nike spot. The video for "Don't Tread" is below. Oh, and he was also raised in a trailer park. Swagballs! Look, America has been starving for a positive role model who we could really look up to ever since Allen Iverson died, and Clint Demps might be that guy. He may also have banged around 4,000 Panamanian women last night. I'm honestly so proud of him. Check out Deuce's rap video and goal scoring celebrashe (en español!) below. And for the record, Monnini is also a pimp who totally bangs Italian chicks LIKE A BOSS.